A few years into our marriage, I had redone the secretary desk that was from my parents home. Originally, it had been stained a dark color by my dad in the 1970’s. In the late 1980’s, I redid it in colors of green and orange. Now, I’m ready for a new incarnation. After doing a lot of looking online at various photos of different colored hutches, I decided to go wtih black. If you want a piece in a traditional color choose black, white/cream, or gray. These are the “neutrals” of painted furniture and will last a long time and work with a wide variety of decorating styles. Since this piece doesn’t have a protective topcoat, I just cleaned any dust and grime off with a slighty damp cloth. I don’t want the pine knots to show this time so spray-primed knot areas with B-I-N (an oil based spray primer) to prevent bleed through. I painted the entire unit with one coat of gray primer (Valspar Latex Enamel Undercoat) I had on hand. I mostly used a 4″ foam roller to apply the primer; a brush was used to work primer into the curves and recesses. After it dried overnight, the first coat of color, Black Onyx (Glidden, Home Depot), was applied with a 4″ foam roller. The first coat should be thin. 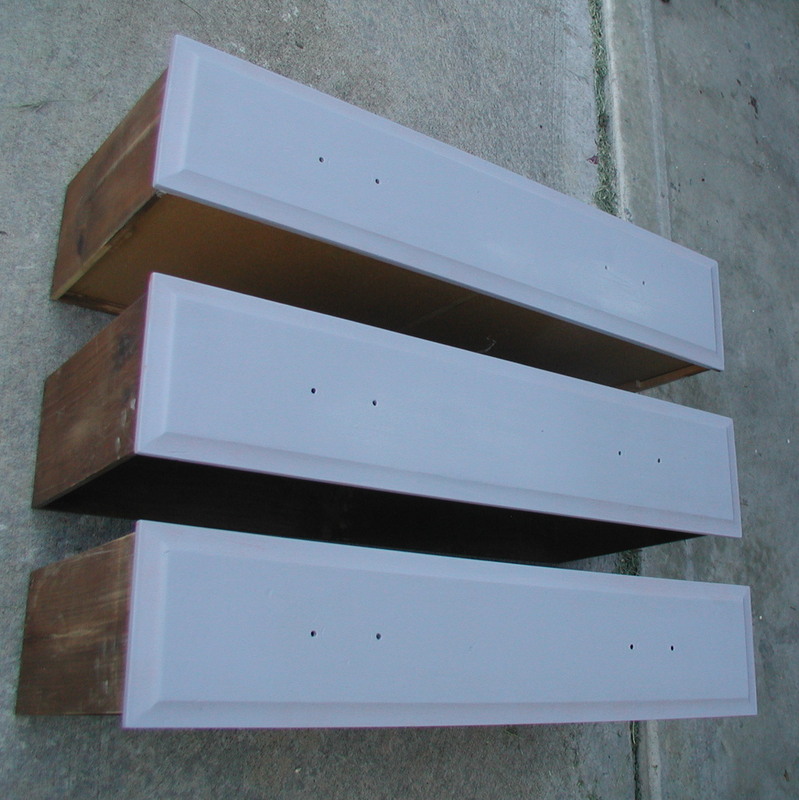 There were a total of 3 coats and between the 2nd and 3rd I did one light sanding by hand with a 220 sanding block. This was enough because the surface was very smooth already. Valspar Waverly Classics – Gull W38006A was used to color the hutch interior and desk area of the Secretary. This was leftover from the bathroom project. I removed the old backing to the hutch area and replaced it with fabric (Hancocks upholstery fabric, two yards on sale for $15). Replacing the backing is an easy fix, especially if it is warped, damage or obviously stained or peeling. I personally like a hutch or shelf unit backing that is a contrast to the main body of the furniture. Nowadays, stencils or wallpaper are trendy for the back decoration. 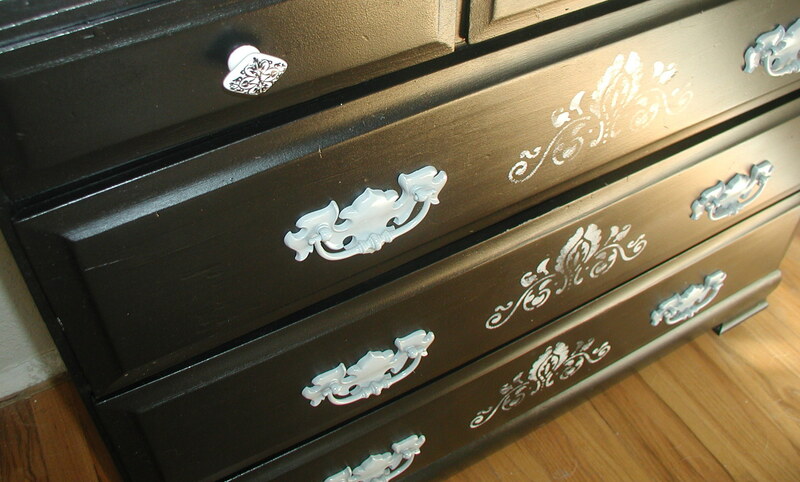 Stencils do best on large flat areas such as drawer fronts, table tops, or the sides of a hutch or dresser. Stencils were in, then out, and now seem to be coming back in. JMO but stencils went out due to overuse and people using multi-colors (i.e. think grapes with green leaves and purple fruit) so keep it simple. A very dry 4″ foam roller was brushed over the stencil to achieve the effect. 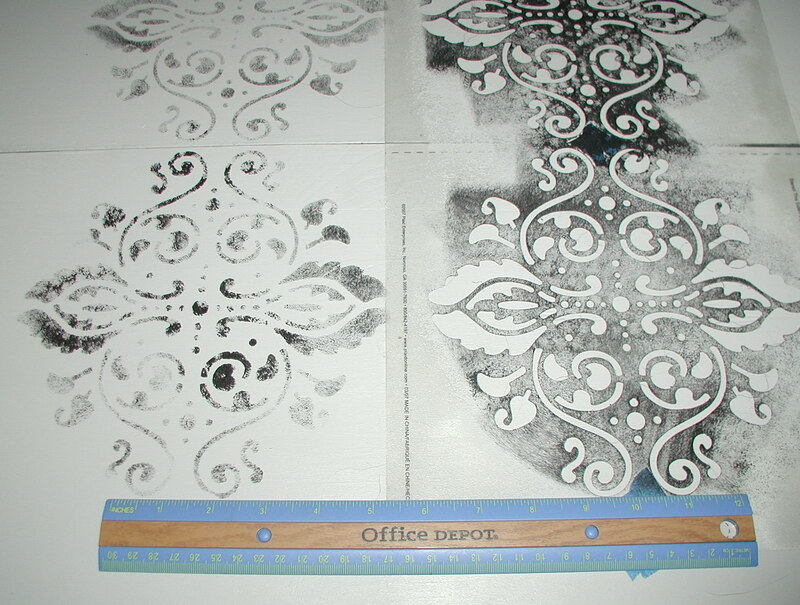 The damask stencil is from Michaels, though Hobby Lobby had a similar, but larger pattern. The only tricky thing about stencils is lining them up and making sure they are truly centered. You’ll need to use a ruler and painters tape to mark out the alignment. Use a tacky adhesive to get them to stay put during the process and make sure you press any curlicues or cut edges down carefully as they often pop back up when the paint is applied, making a smear. When using an adhesive be aware that it will pick up any dust and dirt, so put a piece of tape on the end and hang it to the side (not the floor!) with paint side out to keep it clean. Distressing: I considered it, but decided not to with this piece. It’s not a high quality piece and the drawer fronts are thin boards of pine that would be easily damaged by a heavy hand. NOTE! An oil based poly cannot be used on top of latex paint; it will also yellow over time. Hardware: The drawer knobs are from Hobby Lobby; the lower drawers were the original just spraypainted light gray (Ace Premium Enamel spraypaint). Still thinking on what I’ll put in it – simple white pottery, some silver, and books or …. With the busier backing I don’t want to put in a lot of patterned pieces on the shelves. It also has door fronts that I’m still working on which will be with an open grillwork of some sort. 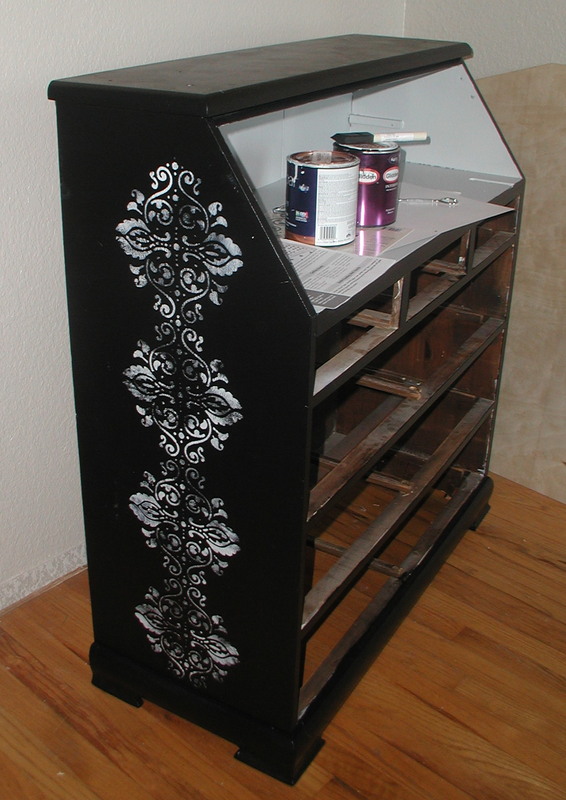 There are as many ways to create your piece of painted furniture as there are minds out there to create it! Before proceeding on a painting project, it’s helpful to do a search for other images that can help you decide on color, pattern, style and technique. Here’s a sampling of some excellent examples of basic painted furniture designs to get you started. BTW, featured projects were used with permission. Photos remain the property of their author. Click on any photo to go directly to the furniture’s home blog post which gives details of the project. Solid color~ one color on a furniture piece can be a statement – especially if you want to go loud and colorful! The key is size, color and finish. Here’s a fantastic trio of red tables (spraypaint) by Janette Drost. Just be aware that one solid color, whether that color is black or firehouse red, can become overwhelming on a huge piece such as an armoire, hutch or bookshelf. 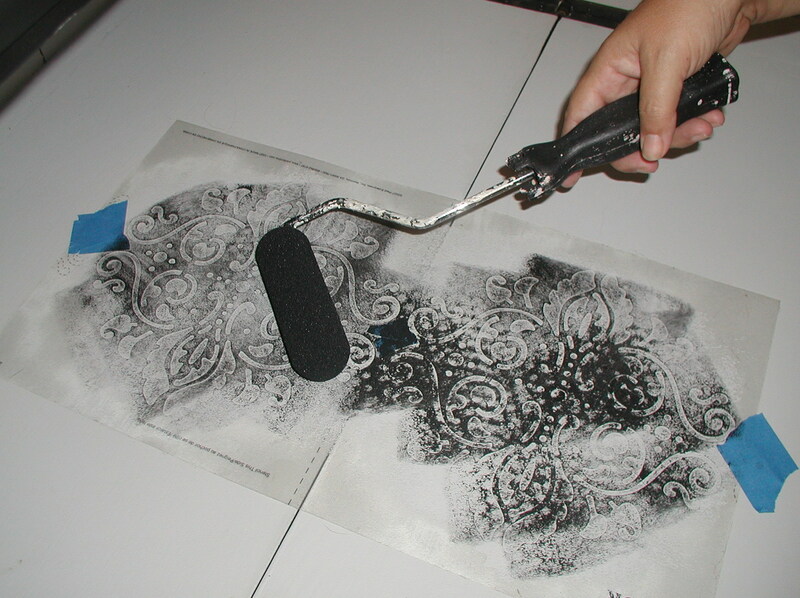 Use distressing, a glaze, or another color to give really large pieces more interest. Two colors – For really large pieces, such as hutches, Secretary desks and bookshelves, using two colors can give more vibrancy to a piece that would have been boring if all in one shade. I’m especially loving pieces that combine painting with a stained counter/desktop. Too many painted pieces in a room becomes a bit boring. Here is a fantastically, subtle piece by Gloria Fox at Potentially Beautiful. Be sure to read the blog post for details on how she brought out it’s full potential (including an unexpected glazing color over the white). Check out this bold look with contrasting drawers of this dresser by DeVore. This really gives a modern, geometric feel to a piece and I love her knob selection. 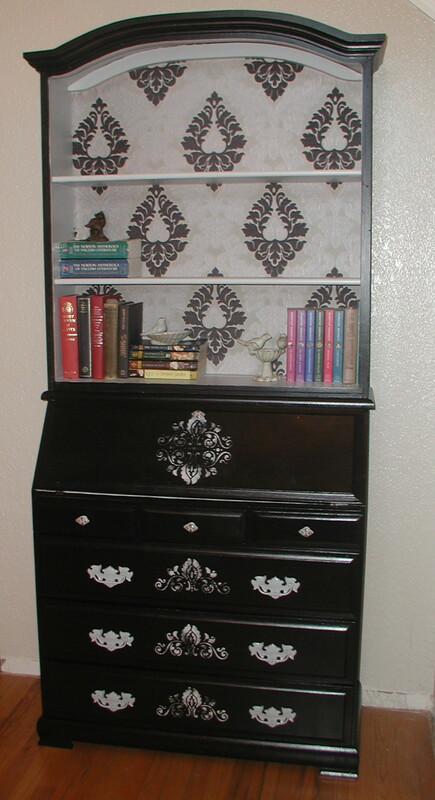 Contrasting backs – I really like having a contrasting back to a bookshelf or hutch. Backings can be stenciled, use fabric or wallpaper, or just be painted/stained a complimentary color. Check out B.E. 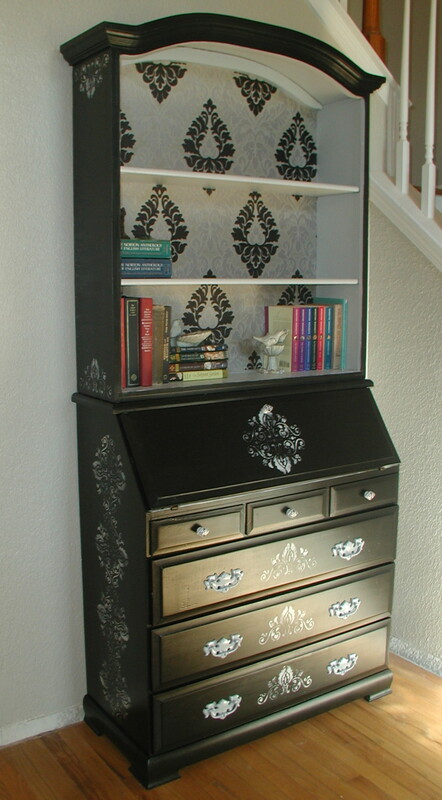 interiors secret surprise armoire ~ a lining of fabric makes it a delightful jewel box. Here’s my secretary desk project, with fabric on the backing of the hutch area. Want it more subtle? My black bookshelves have a stained back. Afraid of stain? Try a gel stain – it’s easier to apply and use. 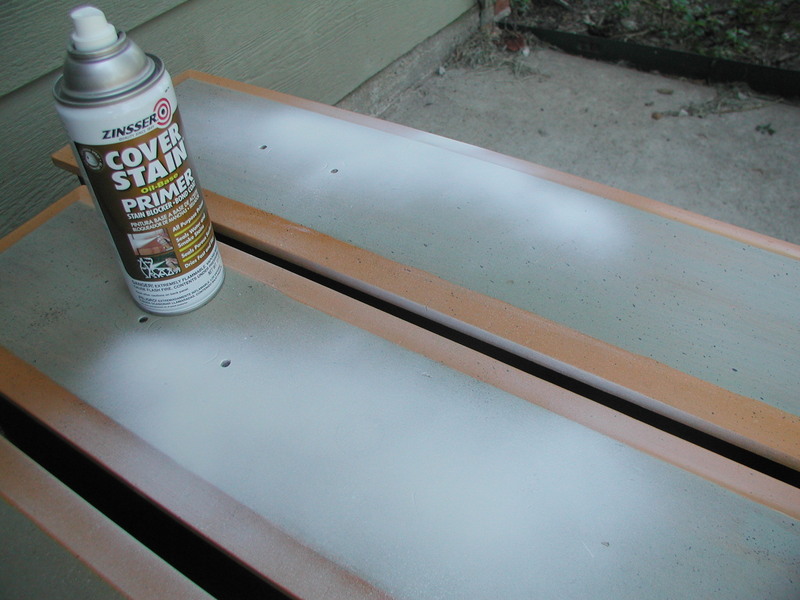 Distressed by sanding with two colors – This method takes two colors: an undercoat and a topcoat which will contrast. JMO but I’d recommend hand sanding (not using the electric sander) to reveal the undercoat because an electric sander can sometimes take off too much until you get used to how it works. 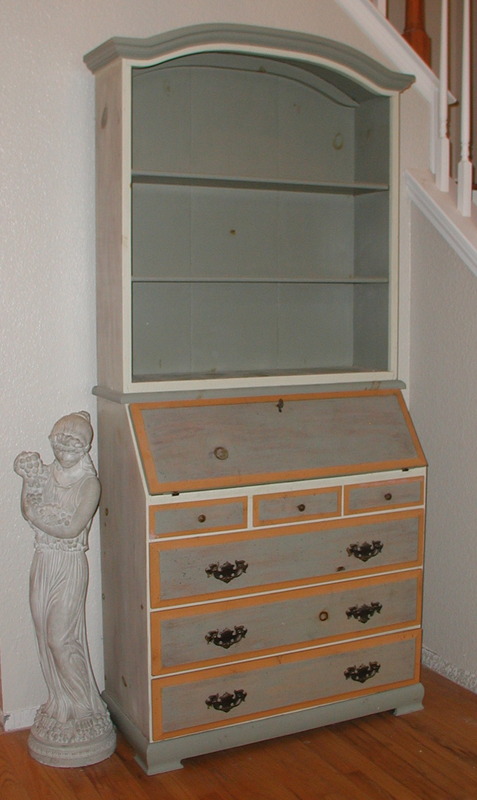 Here is another winner by Miss Mustard Seed… see the post for comparisons of Chalk Paint vs. Milk Paint projects. How much you want to distress back will be determined by how primitive you want your piece to look and she has a large variety of distressed examples on this post. JMO but those with simpler forms with a more country look look better with more distressing, while ornate, carved pieces such as French Provincal look better with minor distressing and glaze. Distressed black with rubbed stain – one of my favorite combinations: paint black, distressed with sanding, and then the bare wood is stained for aging. For example, Walnut stain makes a beautiful contrast to black. Proper and Prim has a lovely black cabinet with a classic style of distressed finish. This style could fit any sort of country – American, English or French. Note how she sanded the area where the cabinet knobs go to simulate natural wearing. I have a DIY post about how this technique is done using the legs of the dining room table. Chippy (paint flaking) – have you seen that old furniture where the paint has chipped off in bits? 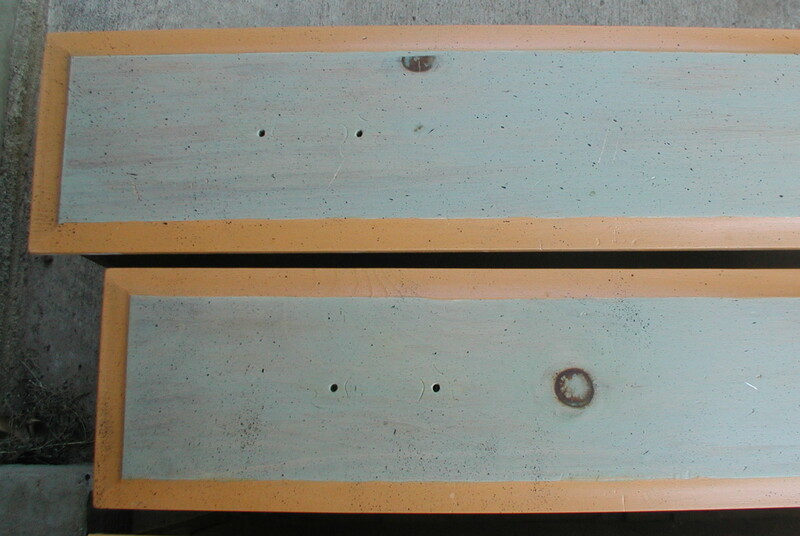 Similar to the two color sanding effect for distressing, this also uses two colors. Where it differs, is the paint is not rubbed off in streaks or batches but chipped off with a tool. Have a dark base and put on some white, and start chunking off the top paint. White over something dark seems to be a favorite combination and The Painted Hive uses a secret weapon to achieve it. Lori at Mud Pie Studio sports a diamond pattern on the side of a desk with a contrasting stained desktop. Her blog post gives complete details and a photo essay of how it was done. What I especially like about this piece is the restraint she used – she could have put polka dots over here, added contrasting painted drawer fronts and put on neon knobs! Instead, it’s tasteful, classic but interesting – a piece that will last a long time, no matter how the room changes. Want it brighter? 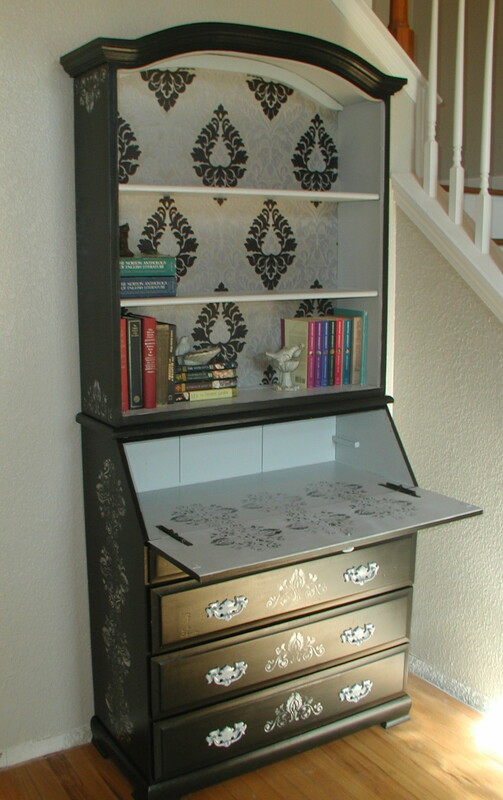 Check out this bureau featuring an Argyle pattern on never a dull day. This reverse, custom stencil project is easier then it first appears. Step-by-step instructions by artist, Lena Corwin show how to make it happen for you (scroll down on the article). Birds are very hot right now in decorating. 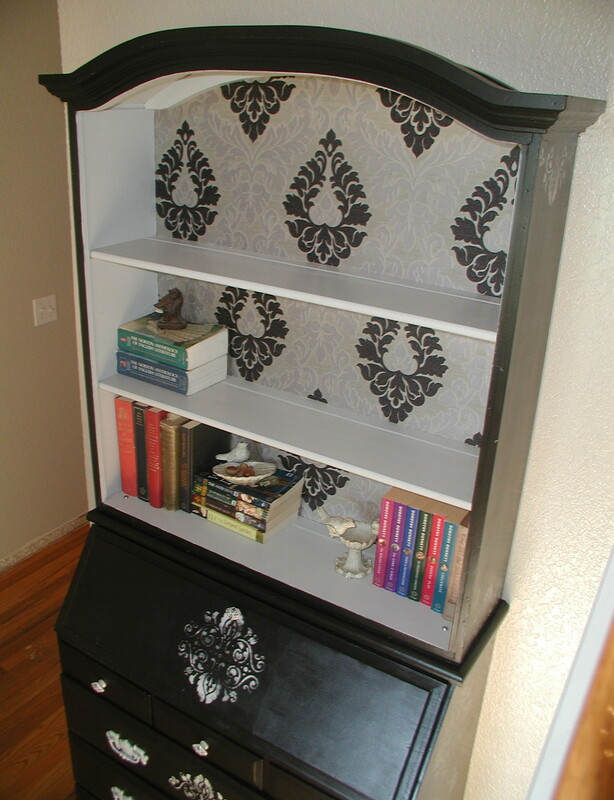 Check out Christina’s classic white-gray-gray desk with bird stencil all done on a non-existent budget. JMO but where stencils go wrong is where they try to appear as if the item is “real” – it’s not still life painting 101! Go with stencils that are contrasting between two colors to give the impression of a form or outline, rather then trying to imitate a photograph. Decoupage – newspaper, letters, stamps, postcards, maps, posters, etc…. A sidetable sweet enough to sing by Miss Mustard Seed. Applying sheet music to the tabletop she goes the extra step with some distressing and an aging topcoat you can read about on her blog post. Some things I really like about this piece is that the size of the table makes it versatile: as a side table to a couch or chair, as well as something that could be tucked in a corner on it’s own or settled next to a desk. The color makes it a piece that will last forever no matter how you change your future style! Sarah and Nathan used an Italian calendar for a beautiful little desk that makes you dream of holidays when doing your homework! This is just a sampling of the many ideas you can use to create your own treasure!